Extremely robust and easy to mount. This is how the new M23 right-angled panel connector from HUMMEL AG will soon be showcased. That fact that it is easy to mount is one of the key aspects in the relaunch of this right-angle connector. All locking and fastening screws are very easily accessible. Clearly visible marking facilitates plugging the connector in, even in cramped and inaccessible working conditions. And important for the finishing stage, contacts, pins and sockets remain unchanged. This means that the new M23 panel connector fits seamlessly into the modular HUMMEL connector system. All casing designs in a product family can be combined with numerous contact inserts. The pin and socket inserts are also interchangeable in any casing shape. Familiar crimping tools can also be used with the new connector. 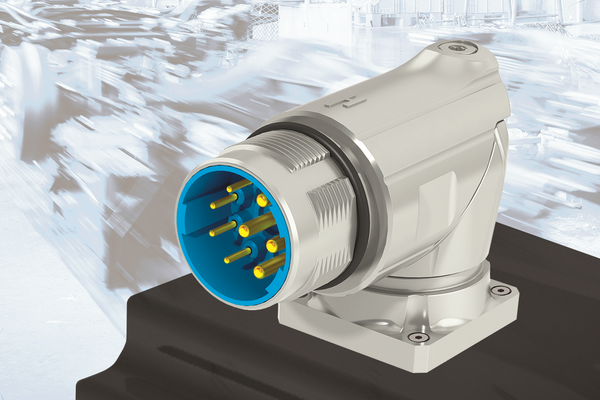 The new M23 panel connector is available as a signal, power and hybrid connector, each with different locking systems. In addition to the screw cap version, there is a TWILOCK quick-release connector version and one that is connector-compatible with the Speedtec locking system. Its compact design is also a significant feature of the trend in miniaturisation. This includes infinitely variable rotatability at an angle of up to 300 degrees. The panel connector is equipped with a flange mounting in two sizes. The mechanical data also demonstrates its robustness and industrial suitability. The connector operates in temperatures between -40 to 125 degrees Celsius and complies with sealing classes IP 67 and IP 69 K in a locked state.